Check out our new stats page and see the over 500 websites that have installed the Occupy Internet widget and the # of hits and unique visitors they’ve generated to date. 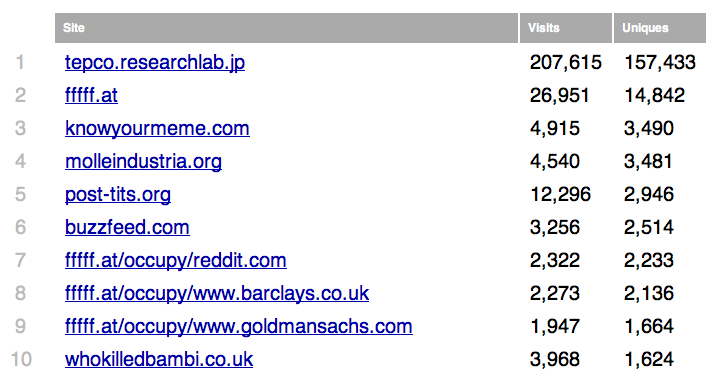 Coming in strong at #1 is tepco.researchlab.jp by Tokyo F.A.T., a protest of the Japanese power company’s wikipedia page — over 150k unique visitors in the last 72 hours. Crazy how the Tepco protest site has exploded! Great protest FAT TOKYO! !